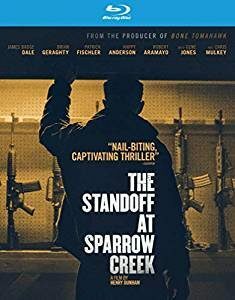 A somber, intense study of macho posturing and paranoia, The Standoff at Sparrow Creek marks an impressive feature debut from writer-director Henry Dunham, who successfully blends elements of Quentin Tarantino’s Reservoir Dogs, Sidney Lumet’s 12 Angry Men and Walter Hill’s Southern Comfort into an appropriately intense thriller. The setting is a small Michigan town where militia member Gannon (James Badge Dale, 13 Hours), a former cop, tries to get to the bottom of a police officer’s murder during a funeral ceremony. In a lumber warehouse, master interrogator Gannon asks fellow militia members to recount the events that occurred leading up to the incident. The underlying fear is that the Feds will halt all militia operations. It’s deduced that the culprit is someone from this particular militia group. Could it be the group’s leader (Chris Mulkey, The Purge), a former Aryan Brotherhood member (Happy Anderson, Bright) or a quietly menacing bruiser (Robert Aramayo, TV’s Game of Thrones)? Only the guilty and his AR-15 know for sure. 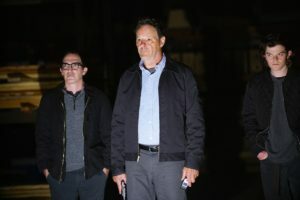 A promising debut for Dunham, both in the directing and writing realm, Standoff is obviously filmed on a low-budget, and is often propelled by deliberately paced and pronounced dialogue some reviewers have compared the screenplay to David Mamet’s works. There are definite cult possibilities here, with the film beginning its ancillary afterlife after being well-received on the festival circuit and generating good reviews during its extremely limited theatrical rollout.